Want to be a treasure hunter? By discerning subtle changes in frequency, this design is capable of detecting coins to a depth of three to four inches. FIGURE 1. 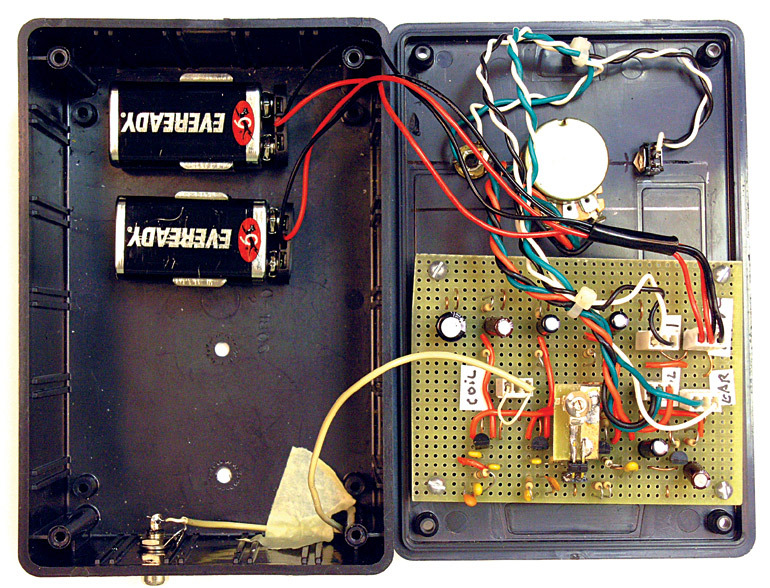 Four Transistor Metal Detector Schematic. Q1 forms an oscillator whose frequency is determined by L1. Q2 is a reference oscillator whose frequency is set by C6. Q3 is a mixer that multiplies the outputs of Q1 and Q2. 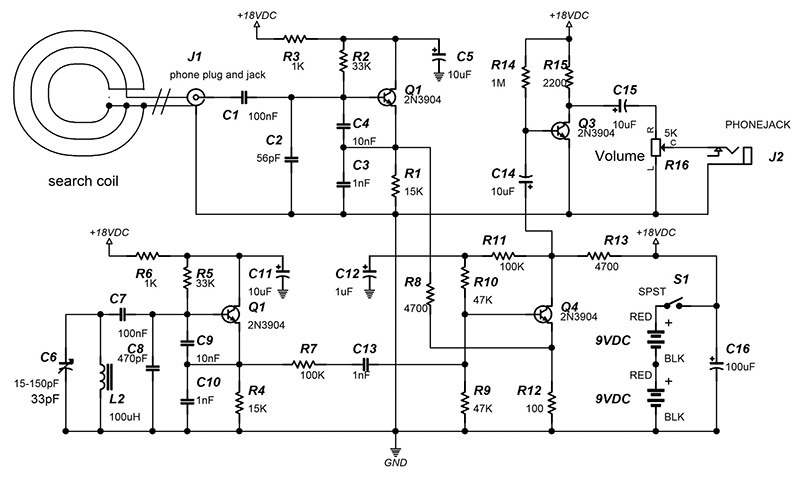 Q4 is a simple one transistor amplifier. L1 needs to be 100 μH. 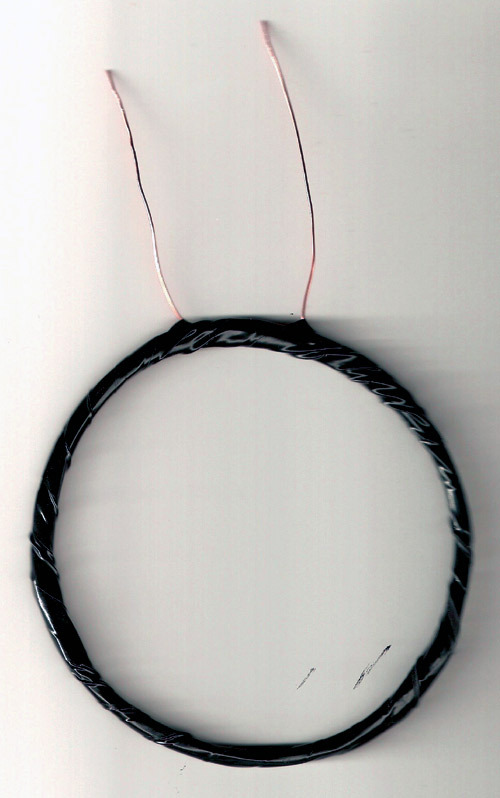 This inductor is created from 22 turns of 22 gauge magnet wire on a four inch diameter coil form (see Reference). However, I wound the coil with 21 turns, resulting in an inductance of 88 mH. The inductance measured into the phono cable with the search coil connected is 126 μH. In order to work properly, you must use the audio cable specified in the Parts List. The resonant frequency is F = 1 / (2π*SQR(L1*C)). C= 1 nF in series with 10 nF + 56 pF. Solving yields C = 965 pF. Calculating for F gives 456 kHz. Therefore, the oscillation frequency of Q1 is 456 kHz when no metal object is near the coil L1. The earphone used in this application must have a high impedance. The ceramic earphone specified in the Parts List has a 20 megohm impedance and works well. Note that both the high land low mixer frequencies are sent to the earphone. 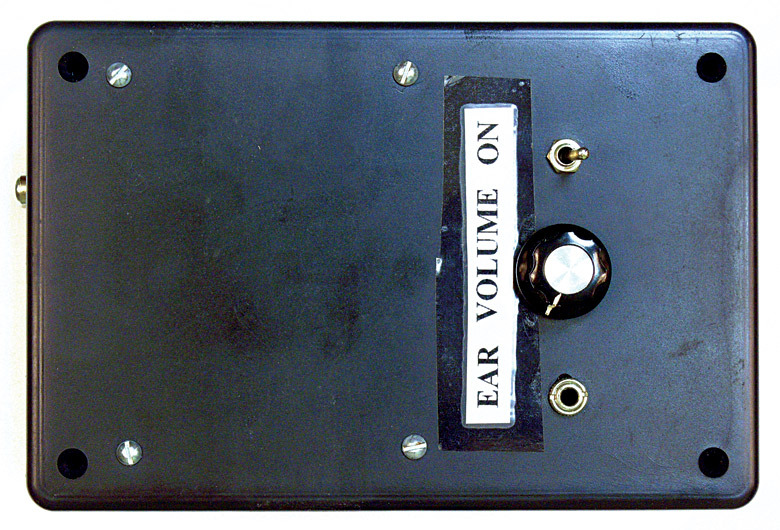 The earpiece shunts the higher frequency to ground, acting as a low-pass filter. The circuit was built on a 2.6” x 3.5” piece of perfboard cut from PC board specified in the Parts List. Make a copy of the schematic and cross off the components as they are installed. An adapter was used to mount C6 (refer to Photo 1). PHOTO 1. C6 Adapter PCB. 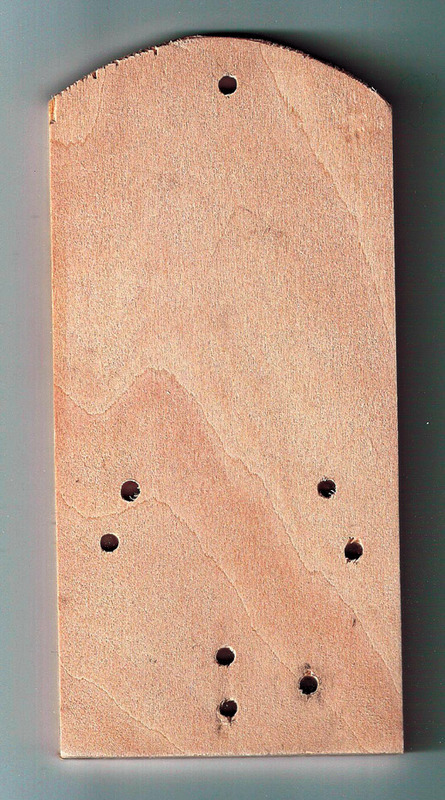 To construct the board, cut a 1/2” by 3/4” piece of double or single sided PCB material. Use a permanent marker to mask the areas where the traces should go. Then, etch the board and clean the ink off with rubbing alcohol. Finally, solder the capacitor and SIP pins to the PCB in surface-mount fashion. This adapter plugs into a two position SIP socket on the PCB. The pins of the adapter can be bent to 90 degrees for top adjustment. The volume control (R16) pin designations are shown in Figure 4. FIGURE 4. 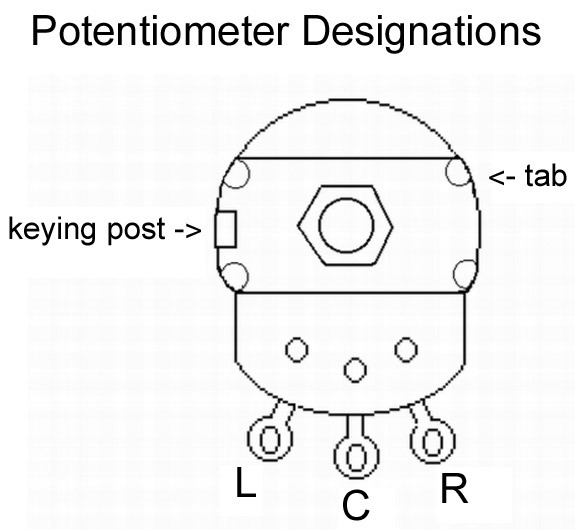 Potentiometer pin designations. \Break off the keying post of R16 with a pair of pliers. Instead of soldering the connecting wires directly to the PCB, .100” male headers are used. These headers are installed for the search coil, volume, S1, earphone, and 18 VDC. Female crimp housing connectors are used to make the twisted pair cable assemblies shown in Table 1. Be sure to note the ground pin on the COIL, VOL, EAR, and 18 VDC connectors. An easy way to do this is to make the ground connections with a black wire in the cable assemblies. Keep the cable to the RCA jack as short as possible to reduce stray capacitance. FIGURE 2. Search coil form. Now construct the wire coil. Wrap 21 turns of 22 gauge solid magnet wire around a 4“ diameter tube (an oatmeal container works nicely). Once the coil is wound, wrap it in electrical tape (see Photo 2). 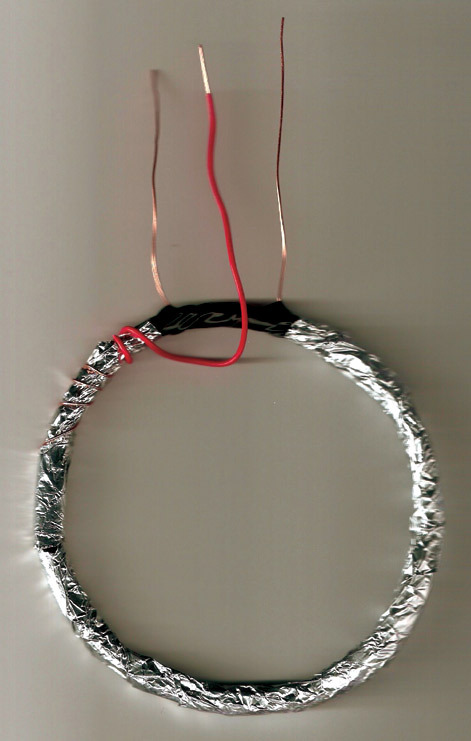 Wrap 1” strips of aluminum foil around the coil, leaving space for the two magnet wire leads. Strip three inches of insulation from a six inch red 22 gauge solid wire. Wrap the three inch bare end of this wire around the aluminum foil (see Photo 3). Wrap the whole coil assembly with electrical tape. PHOTO 3. Shielded coil assembly. Make the search coil strain relief bracket from a piece of aluminum sheet (Figure 3). FIGURE 3. Search coil RCA cable strain relief. A 1/4” grommet is installed in the 1/4” hole. Cut off one end of the RCA cable and feed it through the grommet. Remove 1” of insulation from the end of the RCA cable. Cut the red wire from the search coil to 1/2” long and strip the insulation to 1/4“. Scrape the enamel from the magnet wires with a razor knife and tin with solder. Next, mount the strain relief bracket to the wood slat with a 1/2” 6-32 machine screw, two external tooth lock washers, and a 6-32 nylon lock nut. 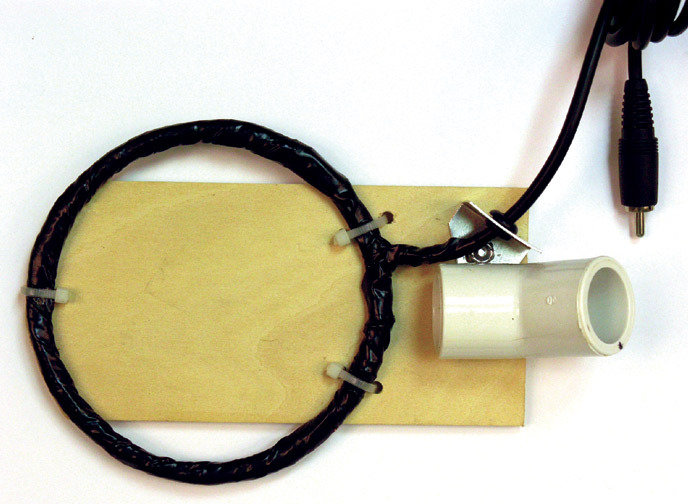 The coil is mounted to the coil form with three wire ties. Finally, attach the 45 degree 7/8” inside diameter PVC elbow fitting to the coil form with two #6 x 1/2” sheet metal screws. 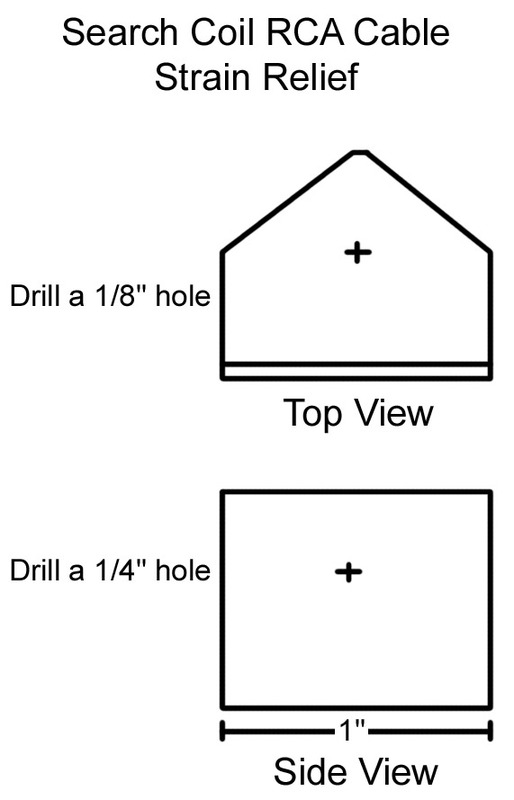 You must first drill 3/32” pilot holes in the PVC joint to receive the screws. This 45 degree fitting receives one end of the metal detector shaft (a 33” long piece of PVC tubing). PHOTO 5. Search coil assembly with bracket. 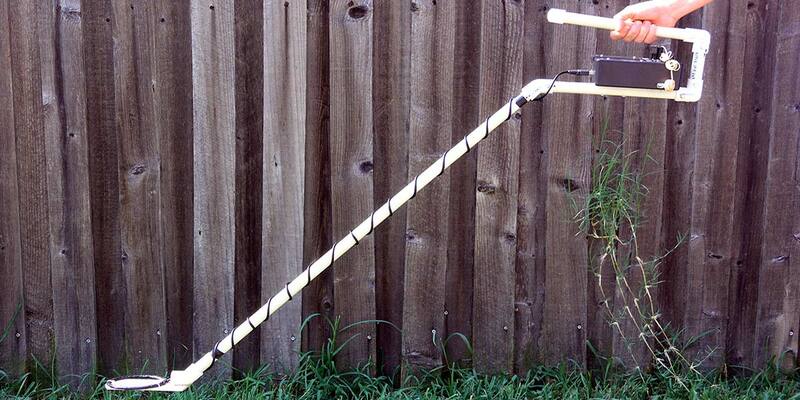 Two 10” and one 3.5” lengths of 7/8” diameter PVC pipe are used when making the handle for the metal detector. Refer to Photo 4 for assembly. PHOTO 4. PVC handle assembly. The handle uses two 90 degree elbows and one 45 degree elbow. Two 5/32” pilot holes and #10 1/2” sheet metal screws are used when connecting each of these elbow joints to the PVC pipes. PHOTO 6. View of open case. Use Photo 7 as a reference when mounting the following items to the front panel: J2, S1, and R16. Drill appropriately sized holes in the lid for these items. PHOTO 7. Front panel view. Next, drill a hole for J1 next to the 45 degree elbow joint where the 33” PVC pipe shaft attaches to the handle. 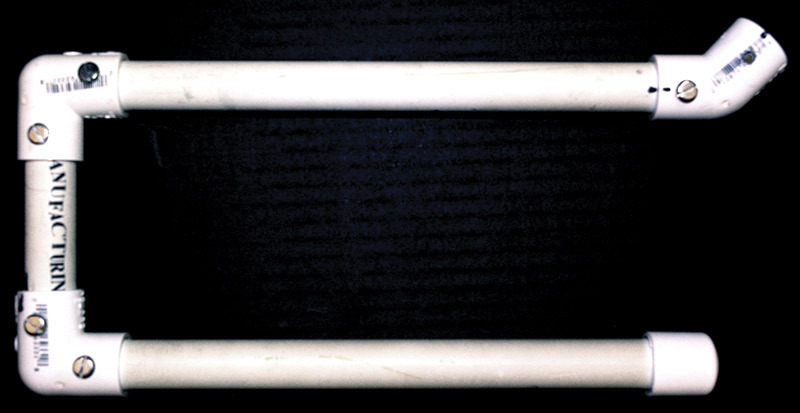 Separate the lower and upper 10” lengths of PVC pipe. Drill mounting holes in the lower 10” piece of PVC pipe to match the holes in the bottom of the case drilled earlier and mount it with two 1-1/4” 8-32 machine screws, external lock washers, and nuts. Now, reassemble the upper and lower 10” PVC pipe sections. Insert the 33” main shaft into the handle assembly’s 45 degree elbow joint, drill a pilot hole, and secure with a #10 1/2” screw. The cap at the end of the handle is press-fit. Similarly, the search coil assembly is press-fit to the end of the 33” metal detector shaft. Plug the RCA cable from the search coil bracket to the metal detector housing RCA jack. 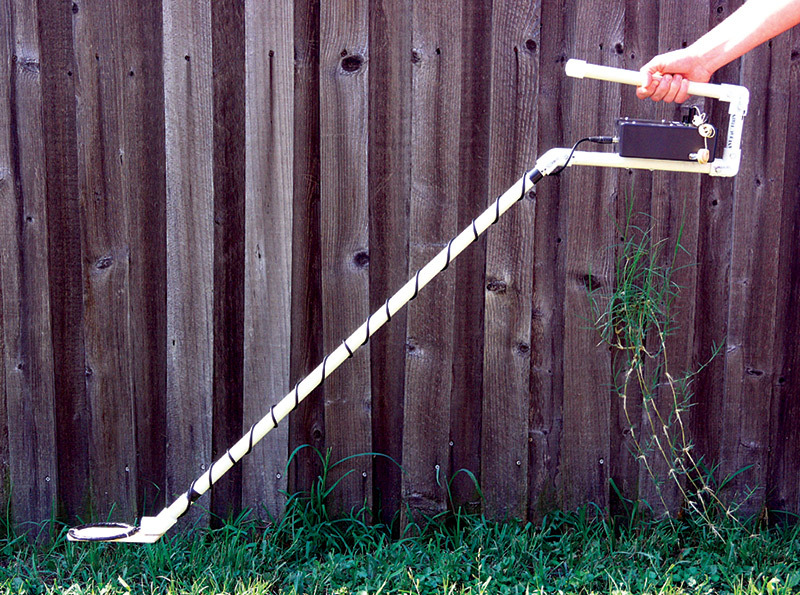 Wrap the excess cable in spiral fashion along the length of the metal detector’s shaft and secure with electrical tape. This will keep the cable from moving and causing a subsequent change in stray capacitance. Plug the ceramic earphone into J2. Turn the volume control completely clockwise. Attach the two 9V batteries to the battery snaps and install the batteries into the holders. Verify that S1 is in the On position. PHOTO 8. Completed metal detector. R. Dean Straw, N6BV, The ARRL Handbook, “Calculating Practical Inductors,” 1999, p. 6-22, The American Radio Relay League.